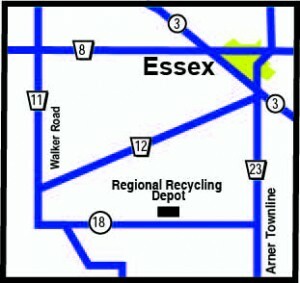 The Essex-Windsor Solid Waste Authority is proud to announce our new Regional Recycling Depot located at 7700 County Rd. 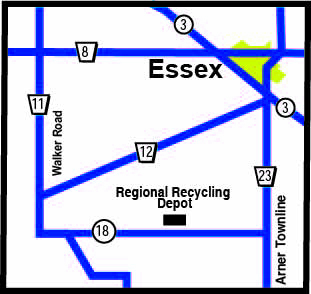 18 in the municipality of Essex. Note: This depot accepts recycling ONLY. No garbage is allowed. Mon.- Fri.: 9:00 a.m. to 4:00 p.m. Sat. : 9:00 a.m. to 1:00 p.m.
New Year’s Day (Jan. 1, 2018) – closed. Family Day (Feb. 19th) – closed. Good Friday (Mar. 30th) – closed. Easter Monday (Apr. 2nd) – OPEN. Victoria Day (May 21st) – closed. Canada Day Lieu (July 2nd) – closed. Civic Holiday (Aug. 6th) – closed. Labour Day (Sept. 3rd) – closed. Thanksgiving Day (Oct. 8th) – closed. Remembrance Day Lieu (Nov. 12th) – OPEN. * There will be a cost associated with some materials. Absolutely no garbage will be accepted at the Regional Recycling Depot.